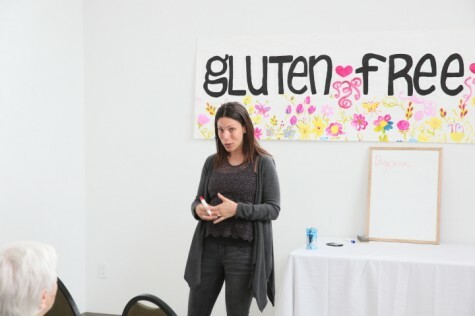 Dr. Jodi Larry discusses how gluten can affect your physical and mental health. In this week’s finale, naturopathic doctor Jodi Larry explains how gluten might be affecting how you feel on a daily basis in her talk, DEMYSTIFYING GLUTEN. No longer is going gluten free just for people with celiac disease—there is a growing community of those who are gluten sensitive or gluten intolerant and they often suffer from such conditions as irritable bowel syndrome (IBS), depression, inflammatory conditions, fatigue, skin ailments and more. Tune in to get the facts about gluten and learn about how changing your diet might just be the answer to your health problems. Curious about how changing your diet can help you feel better? After a busy few months planning last spring’s GFG, we were too! Check out our 10 days of cleansing and learn more about Dr. Jodi Larry’s Cleanse for Life program here! Dr. Jodi Larry, ND, has a resilient passion for health and healing. After being struck with a rare virus at the age of 10, her life was transformed by a naturopathic doctor and she has been utilizing naturopathic principles ever since. Dr. Larry graduation from the doctor of naturopathic medicine program at the Canadian College of Naturopathic Medicine is a member of the Canadian Association of Naturopathic Doctors and is registered with the BDDT-N. With a strong dedication and years of experience with naturopathic treatments paired with an ambitious energy and calming attitude, Dr. Larry creates an environment that allows her patients to take charge of their health and transform their life. She practices family medicine, with a strong focus on mental health, women’s health and digestive health. All naturopathic treatments are used in her practice, with an emphasis on nutrition, herbal remedies, counseling and acupuncture. Dr. Larry is also the creator of Cleanse for Life: a unique guided group cleanse program that has been inspiring vital health for seven years.